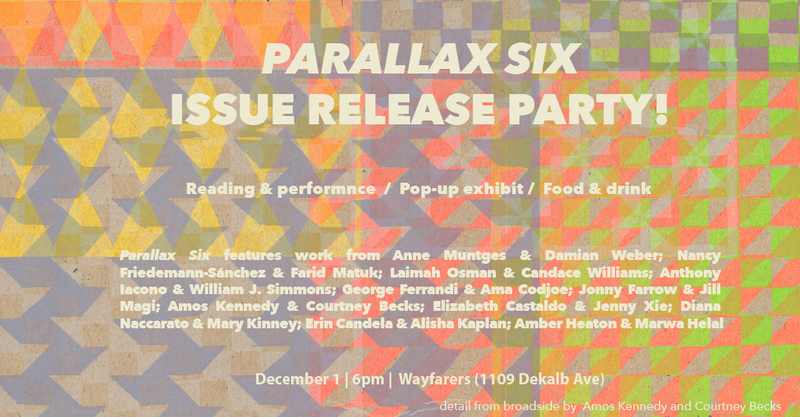 Parallax Six Issue Release Party! + Food, drinks, and merriment! Jill Magi’s books include Threads, Torchwood, SLOT, Cadastral Map, LABOR, andPageviews/Innervisions, a monograph on textimage hybridity. Jill has blogged for the Poetry Foundation and written commentaries for Jacket2 on “a textile poetics.” Residencies awarded include the Lower Manhattan Cultural Council Workspace Residency and the Brooklyn Textile Arts Center. She has had solo exhibitions with Tashkeel in Dubai and the Project Space at New York University Abu Dhabi where she joined the faculty in 2013. Courtney Becks is the Librarian for African American Studies and the Jewish Studies Bibliographer at the University of Illinois at Urbana-Champaign. Her research interests include fashion, style, and (Black) aesthetics. She has created a fashion zine. Emmy Catedral is an artist and writer working in performance and installation with things made with paper, including books. She sometimes presents work as The Explorers Club of Enrique de Malacca, and The Amateur Astronomers Society of Voorhees, which hosted a salon with Columbia's Department of Astronomy this past Spring. Emmy is also co-founder of the Pilipinx American Library, which recently completed summer residencies at Wendy's Subway, Brooklyn, and the Asian Art Museum, SF. She is the Fairs & Editions Coordinator for Printed Matter, Inc.
Elise Wunderlich is a multimedia artist originally from Portland, Oregon. She received her BFA from the Rhode Island School of Design's Sculpture Program and currently lives and works in Brooklyn, NY. Singing Saw Press will exhibit at Pioneer Works' Press Play, "a book and music fair celebrating the merits of independent publishing and the dissemination of the arts through publication, recorded sound, and their expanded mediums." Saturday August 4, 12 - 7 pm. User manuals. Maps. Stage directions. Rulebooks. Recipes. Musical notation. Written and illustrated instruction spans many genres and forms, from the vaunted to the lowly. This course introduces the basics of typesetting and letterpress printing through a specific project: print your own instructions. We will explore some of the ways that artists and writers have mined the instructions in their work, and examine the graphic and poetic potential of mundane directions, especially when removed from their utilitarian contexts. Participants will select a single instruction or imperative phrase as the basis for an original broadside, of which they will produce a small printed edition. Participants will learn to set type, carve a linoleum block, and print on a Vandercook proof press. The workshop will culminate in a print exchange, producing a haphazard manual of participants’ collective instructions.